Here is another image Bernie McCoy took, this time a featherweight scarf and a bangle made from undyed fibres. 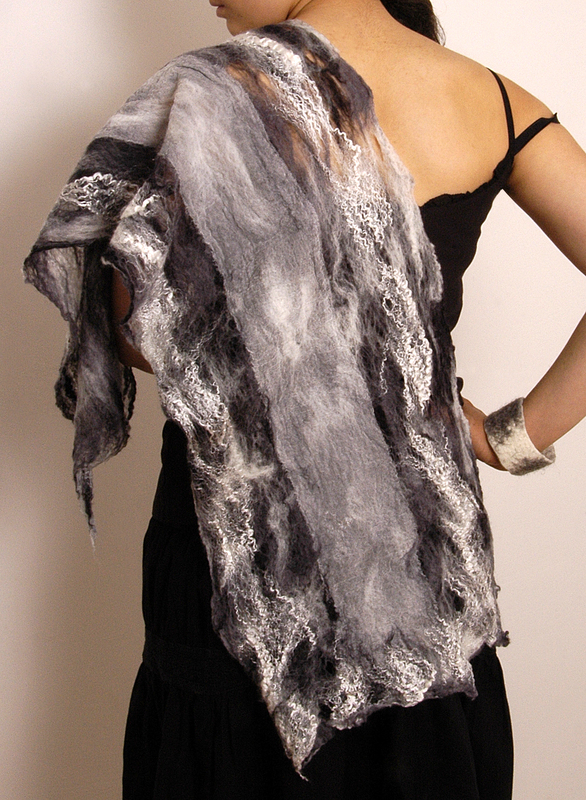 This scarf is one of my mother’s favourites, extremely light and amazingly warm! The wool used is merino and I added quite a lot of mulberry silk which creates a nice sheen when viewed from different angles. The panel down the centre is a very fine chiffon silk which strengthens the cobweb felt and enables it to drape beautifully. The bangle is one of my own favourites, very plain and simple in natural undyed fibres. Thanks to Joni who left me a comment and to everyone who actually sent me a text about Bernie’s photography of my work. I am really excited about getting some of the images printed out and into my portfolio, a vital project for July! This entry was posted in Felt and tagged bangle, chiffon, cobweb Bernie McCoy, Felt, images, merino, mulberry, photography, portfolio, scarf, silk by Nicola. Bookmark the permalink.